Below are two articles that may be significant part of the soft disclosure process regarding Antarctica. Here are some quotes from the articles which basically reveals that they want to take another babystep towards disclosures life never seen before on earth. "But we're picking up DNA from plants and animals in the caves, which suggests that there might be whole communities living beneath the ice that we don't know about." "Researchers say further investigation could unveil new species of plants and animals not discovered before." A new study led by the Australian National University (ANU) used DNA sequencing techniques to forensically analyse soil from the caves, which revealed traces of DNA from algae, mosses and small animals. Researchers say further investigation could unveil new species of plants and animals not discovered before. ANU Fenner School of Environment and Society senior lecturer Dr Ceridwen Fraser said they had forensic evidence of potential plants and animals living in the caves. "But we haven't seen those plants and animals, so we can't be sure they're there," she said. 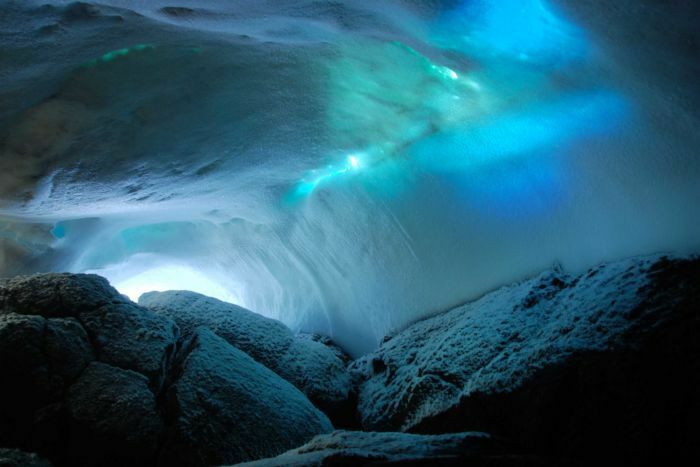 Previously undiscovered animals and plants may live in warm caves under Antarctica's glaciers, according to a new study led by the Australian National University. ANU Fenner School of Environment and Society senior lecturer Ceridwen Fraser, who led the study, said some of the DNA sequences were unrecognised in the researchers' database. "That might just be because there are plants and animals in Antarctica that we haven't sequenced at those parts of the genome before, so they might just be your bog-standard plants and animals from Antarctica, or they might indicate something more exciting, like species that we don't know anything about yet," she said.